Before we look at how you should go about surviving your tougher days, let’s first look at why being a webmaster can get so hard in the first place. Usually this comes down to seeing your site suffer in the rankings or your profits go down. After years of working to the utmost of your ability, it only takes for Google to decide they’re going to change their algorithm and your site can suddenly stop getting hits and stop making anywhere near the money. This can be very distressing, but when you then combine that with a lack of faith in your website in general, with negative SEO attacks on your site and with unwelcome messages from users that don’t appreciate your hard work… well then that’s when you can consider throwing in the towel altogether. Save Your Positive Messages and Successes: You might be having one of the dark days now, but there were good days too remember? The days that made it all worth it? You will have seen your website featured in magazines perhaps, or you will have gotten friendly messages from fans who love your work… and all this can make it worthwhile. What you need to do then is to collect all of this positive material and put it in one place. Now you can return to that whenever you need a bit of a pick-me-up. Be Inspired: If you’ve lost the motivation you normally get from your site and your own individual drive, then it might be time to start looking for it elsewhere. And one great place to get this is from other people you admire – whether that means watching a TED talk, or chatting to the friend who introduced you to the world of the web. 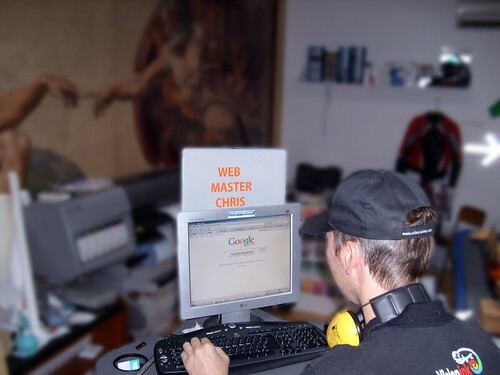 Take Some Time Out: Everyone needs a holiday – even webmasters. If you’re stressed out about your site and starting to lose the love, then sometimes getting a little distance can be just what the doctor ordered and help you to return with a renewed sense of vigour. Have Back Up Plans: Perhaps most useful of all is to make sure that you have lots of backup plans and that you aren’t putting all your eggs in one basket. This could mean for instance having more than one website, or it could mean developing an app to make money on top of your AdSense. Either way, it means that you’ll always have something to fall back on and you’ll always be able to keep up that sense of momentum. This article has been written by Keith Terrell, who is the proud owner of Orp Media in Australia. He is very passionate about still photography and stop-motion filming techniques. This entry was posted on Monday, August 19th, 2013 at 10:03 am and modified by WebMaster View on Friday, March 21st, 2014 at 2:36 pm. You can follow any responses to this entry through the RSS 2.0 feed. Responses are currently closed, but you can trackback from your own site.